What if both could be true? Do you find yourself disappointed by the two-party system? Do you like the idea of voting for someone else but hate the idea of wasting your vote? What if Never Trump and Never Hillary could both actually turn out to be true? 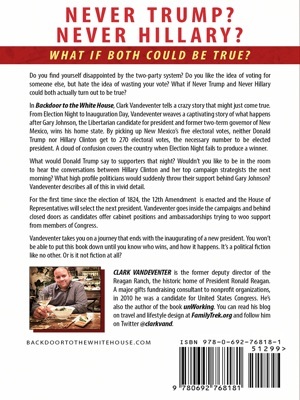 In Backdoor to the White House, Clark Vandeventer tells a crazy story that might just come true. 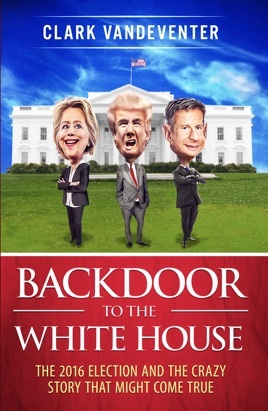 From Election Night to Inauguration Day, Vandeventer weaves a captivating story of what happens after Gary Johnson, the Libertarian candidate for president and former two-term governor of New Mexico wins his home state. By picking up New Mexico’s five electoral votes, neither Donald Trump or Hillary Clinton get to 270 electoral votes, the necessary number to be elected president. A cloud of confusion covers the country when Election Night fails to produce a winner. What would Donald Trump say to supporters that night? Wouldn’t you like to be in the room to hear the conversations between Hillary Clinton and her top campaign strategists the next morning? What high profile politicians would suddenly throw their support behind Gary Johnson? Vandeventer describes all of this in vivid detail. For the first time since the election of 1824, the 12th Amendment is enacted and the House of Representatives will select the next president. Vandeventer goes inside the campaigns and behind closed doors as candidates offer cabinet positions and ambassadorships trying to woo support from members of Congress. Vandeventer takes you on a journey that ends with the inaugurating of a new president. You won’t be able to put this book down until you know who wins, and how it happens. It’s a political fiction like no other. Or is it not fiction at all?